Frosh is an amazing event that allows first year attendees at Douglas College to meet a lot of people, build new relationships and HAVE FUN! This year, we ran through events such as the Blind Obstacle Course and Rough Mudder - obstacle courses that force you to build trust and communication quickly for success (while getting down and dirty! ), Cup Stacking (which our team ROCKED at! ), dodge ball, and everyone’s favorite, So You Think You Can Dougie, where every group was taught a short hip-hop dance and then presented it on the final day of Frosh. Each team could earn a certain amount of points at every station, points for social media participation, costume, team flag and team name. 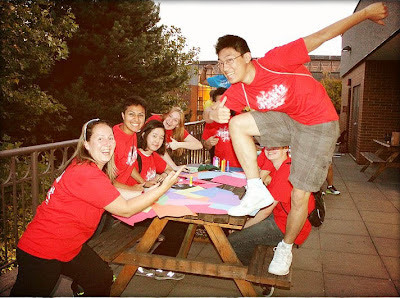 This year, for Frosh12, I volunteered to be a team leader, and had so much fun doing it. Being able to lead a group of new students from different programs, different backgrounds, etc., was an amazing experience that I will remember forever. My team, although on the small side with only 8 participants (including the 2 co-leaders), did not go unheard! Over the whole weekend of events, they had the heart, charisma and true Douglas spirit of a team of 20! They just never gave up. The fact that we were a smaller team allowed us to bond faster and more in depth as well as enabled us to build strong relationships with one another. My final words: I strongly suggest that every student attending Douglas College take part in at least one event with Douglife. You will not be disappointed! From personal experience, it helps to gain a healthy balance of fun, friends and memories. For more photos of Frosh 12, check out Douglife's Flickr album.